Watching a dog go through the grieving process is as painful as watching a friend or relative go through the stages and come to terms with their bereavement. The advantage we have is, we find solace in the words and actions of those who care about us and our faith. Dogs depend on us, their caretakers, to sense and ease the pain of their suffering at the loss of a human or dog companion. 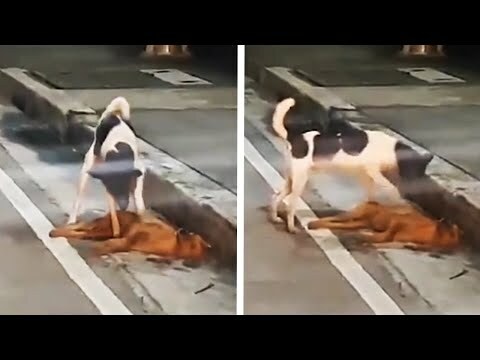 This heart-breaking footage shows the moment a stray dog frantically tries to revive his friend who was killed in a hit-and-run accident. Sadly, the dog hasn’t realized she has gone and desperately scratches and paws at the brown mongrel. He gently prods her head and tries to lift her leg up with her mouth in a final attempt to guide her to her feet. The dog spent several minutes trying to wake the dead female before grudgingly giving up and creeping away along the pavement. Observer Jay Villanueva was driving home when he parked up to video the tragic scene, which he said ‘broke his heart’. He said: "Drivers should be careful not to hurt anyone on the road, even dogs." They do not understand the right of the way; they don’t understand traffic rules such as "Stop, look and listen"
"Some people will say," Oh, it's just a dog, "but watch the video, they're like a family, like best friends, life is also very important to them. DoglopedixWatching a dog go through the grieving process is as painful as watching a friend or relative go through the stages and come to terms with their bereavement. The advantage we have is, we find solace in the words and actions of those who care about us and our faith. Dogs depend on us, their caretakers, to sense and ease the pain of their suffering at the loss of a human or dog companion.